Meet Edwardsiella andrillae, a recently discovered species of sea anemone that lives anchored to the underside of sea ice offshore of Antarctica. The species was discovered in December 2010 during a test run of an undersea robot by a research team working for the Antarctic Geological Drilling (ANDRILL) Program*. The anemone was named in 2014 after the program. 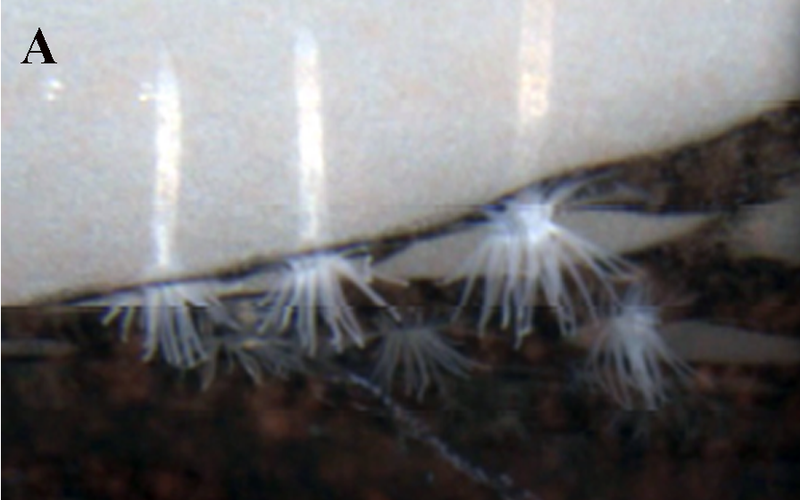 Although other sea anemones have been discovered in Antarctica, E. andrillae is the first and only known species to live in ice. The ANDRILL Program was originally on a mission to learn more about undersea currents under the Ross Sea, a deep bay of the Southern Ocean in Antarctica between Victoria Land and Marie Byrd Land. After drilling a hole, the research team lowered a camera-equipped robot under the ice where they made an unexpected discovery, which was later described by Frank Rack of the ANDRILL Science Management Office at the University of Nebraska-Lincoln as "total serendipity." 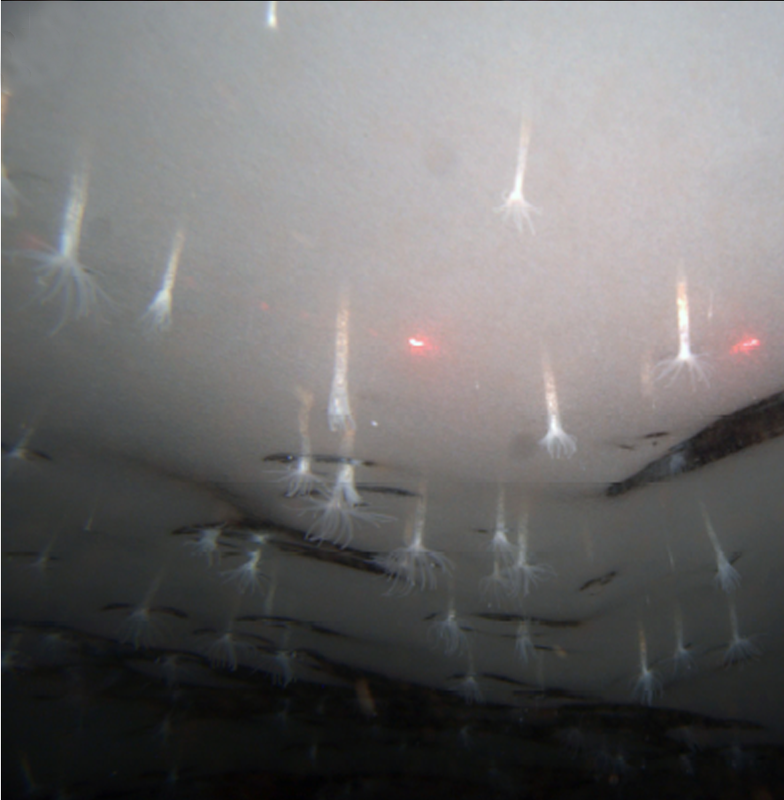 Thousands upon thousands of small sea anemones were burrowed into the underside of the ice shelf with their tentacles protruding into the water like flowers on a ceiling. As the scientists didn't not expect to come across any biological life under the ice, they were unprepared to retrieve any samples or document sea life. In order to get samples, they used hot water to stun them and with an improvised suction device they removed them out of their burrows. The team didn't have any preservation equipment so they placed the specimens in ethanol and had them transferred to the McMurdo Station (a U.S. Antarctic research center on the south tip of Ross Island) for further examination. There the specimens were placed in formalin. As of today, the anemone has only been spotted under the Ross Ice Shelf. The collected specimens were less than an inch long when contracted and featured between twenty and twenty four tentacles that expanded out to three to four times their original size when relaxed. This includes eight tentacles which are longer and located in a ring around the inside of the creature and twelve to sixteen on the outer ring. 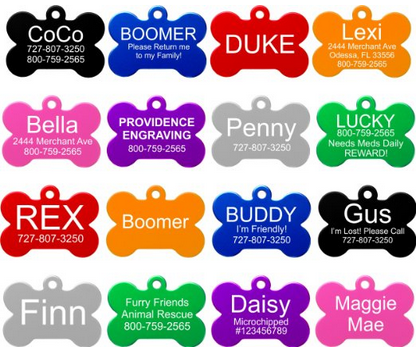 Not much else is known about the species. For example, it is a mystery how the species attaches itself to the ice, as it would be unable to conventionally burrow into it as other members of the family do in sand. Furthermore, researchers are puzzled from E. andrillae ability to survive the low temperatures without freezing to death. But that's not all. Reproduction and diet are also unclear although it is speculated that the species feeds on the plankton in the water. Credit: Frank Rack / ANDRILL Science Management Office, University of Nebraska-Lincoln. - On 23 May 2014 International Institute for Species Exploration chose E. andrillae as one of the "Top 10 New Species of 2014", due to its unique habitat. - E. andrillae wasn't the only creature spotted under the ice. The scientists also witnessed fish that routinely swam upside down with the ice shelf serving as the floor of their undersea world. 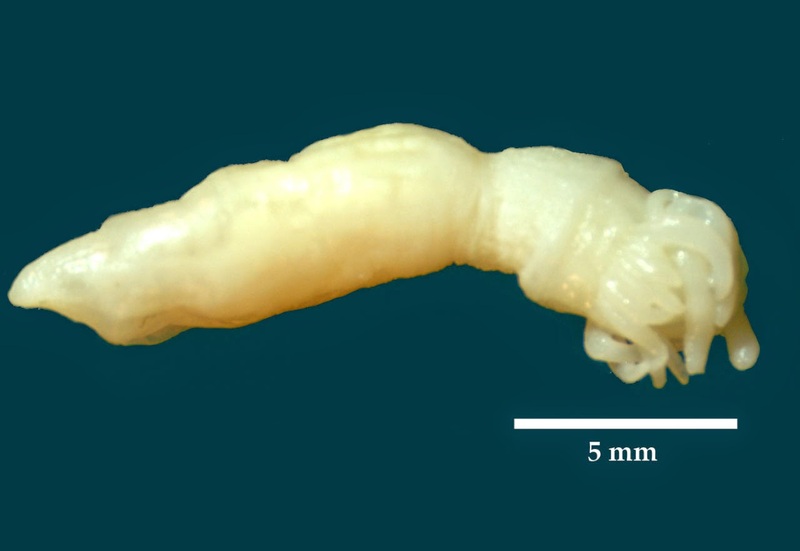 They also reported seeing polychaete worms, amphipods and a creature they dubbed "the eggroll," a 4-inch-long, 1-inch-diameter, neutrally buoyant cylinder that seemed to swim using appendages at both ends of its body. The eggroll was observed bumping along the field of sea anemones under the ice and sometimes hanging on to them. - The research team has plans to further study the environment below the ice. NASA is also helping fund the research, as it has implications in the search for life on Jupiter's moon, Europa. 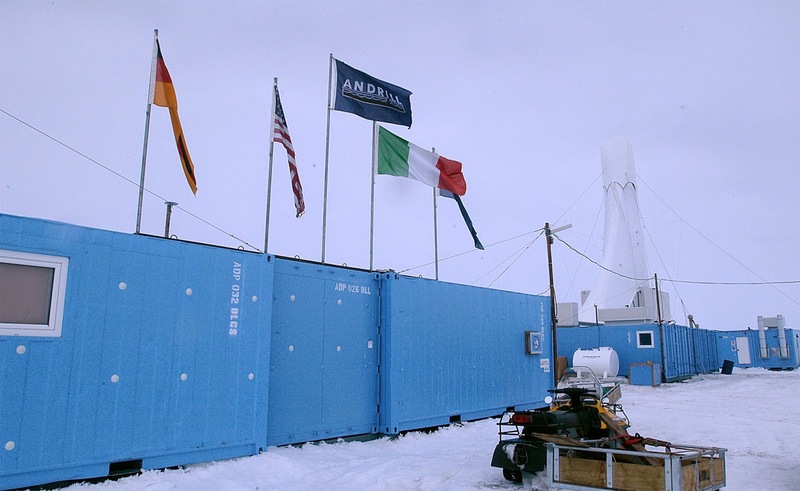 ANDRILL (ANtarctic DRILLing Project) is a scientific drilling project in Antarctica that gathers information about past periods of global warming and cooling. The project involves scientists from Germany, Italy, New Zealand, and the U.S. The team has drilled through ice, seawater, sediment and rock to depths greater than 1,200 m and has recovered a virtually continuous core record from the present day to nearly 20 million years ago.